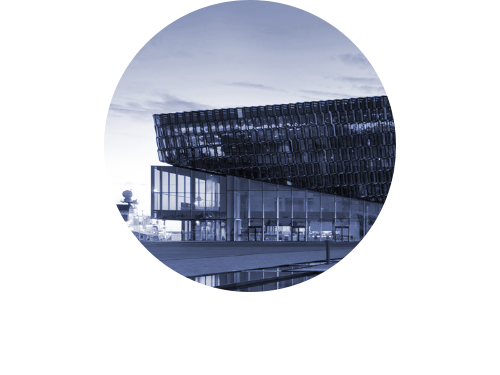 A spectacular addition to the Icelandic cultural landscape, when the Harpa Reykjavík Concert Hall and Conference Centre opened its doors to the public in May 2011 it was unanimously acclaimed as one Iceland's most important contemporary buildings. As the city's first purpose built concert hall, it successfully combines being used as a classical music venue – serving as the home to the Iceland Symphony Orchestra and The Icelandic Opera – with hosting conferences and exhibitions. The Harpa was the brainchild of Henning Larsen Architects and Batteríið,while the renowned artist, Ólafur Elíasson, designed the façade. It consists of a steel framework clad with 10,000 irregularly shaped glass panels of different colours that reference the columnar basalt common in Iceland's terrain. The use of the glass panels provides a dramatic effect when the unique daylight in Iceland – which ranges from almost 24 hours in summer to the briefest glimpse of the sun above the horizon in winter – covers the building in a myriad of different colours. It consists of four halls, three of which are used for concerts. These comprise a main concert hall seating up to 1,600 people, a rehearsal hall that can also be used for concerts seating up to 450, and a chamber music hall seating 200. With events taking place on a daily basis, protecting the public and staff is vital and the building's fire detection system plays an important role in keeping them safe. Scheving and his team knew that traditional point detection would not be possible due to the Harpa's very high ceilings. He comments, ‘Some of ceilings are over 70m high so three Hochiki Europe FIRElink aspirating fire detection systems were needed to provide the requisite level of cover above 10m. These are linked to four control panels which have 1,600 addresses assigned to them in 24 separate zones'. The FIRElink systems are configured around Hochiki's Enhanced Systems Protocol (ESP) – a robust addressable communications solution for intelligent fire detection and fully integrated systems. ESP delivers exceptionally secure signalling and also incorporates error-checking technology to safeguard the integrity of the data and ensure correct communication. The system also has features drift compensation technology that, when activated by the control panel, automatically recalibrates the detectors every 24 hours. Aesthetics at the Harpa are very important and design continuity has to be maintained at all times. Being able to install the FIRElink systems' pipework in the ceiling voids helped ensure this, as did the availability of ALG-E optical smoke detectors in black to match the colour of the ceilings in some of the rooms. The system also utilises a wide variety of other addressable devices from Hochiki Europe including HCPE-E manual call points, YBO-BSB base sounder beacons, ACA-E multi-heat sensors, ACB-E multi-heat sensors, CHQ-DIM dual input modules and CHQ-DRC dual relay controllers.